Every year, hundreds of people gather at a village near Shimla to celebrate a festival dedicated to the Goddess Kali. They take out a procession for some time. Then they throw stones at each other. 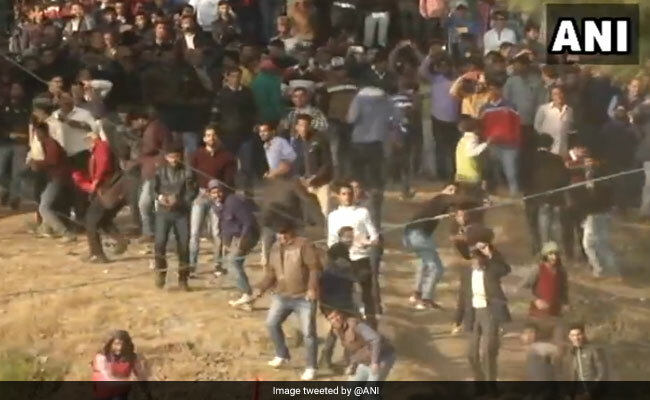 The young representatives of the royal family of Dhami, 40 km from Shimla, participated in the stone-throwing festival this year to preserve their centuries-old tradition. Locals say it is their belief that the former queen of Dhami gave her life to end the practice of human sacrifice and asked people to start a fair, where two clans would throw stones at the sky and until someone is hit, and the blood of that person would be offered to the Goddess Kali. On the festival day, a large procession started from a temple built by the former king of Dhami. Soon, hundreds of people from two local clans gathered at the place where they would soon be locked in a stone-throwing battle. "This fair had been celebrated here for centuries, I have heard from the elders, it is nearly 400 years old," a fair organiser said. "It was started with an effort to end the cruel tradition of human sacrifice. A large number of people gather here to see the fair."